Our intent is to promote secondhand clothing, but to also encourage keeping clothing for longer (hence our love for vintage) and to encourage quality over quantity (hence our interest in designer). 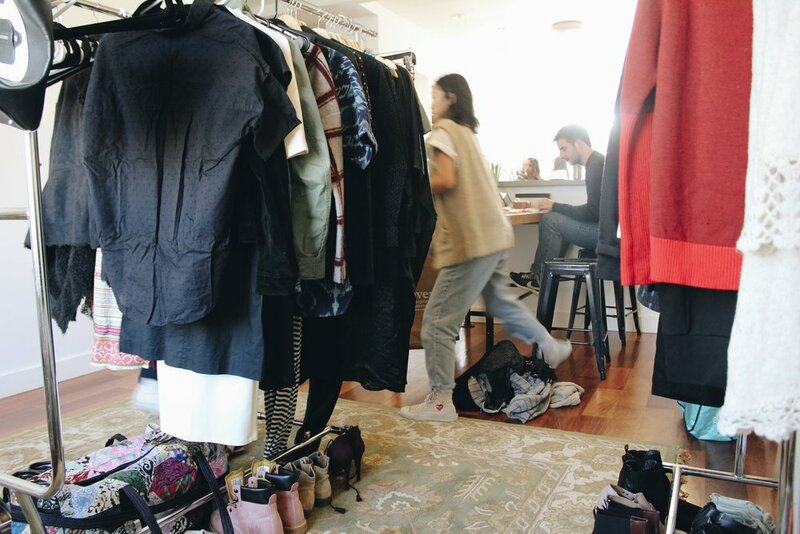 If you have something outside of these categories that is not fast fashion or any big box brands, bring it over! We'd love to still take a look. We also would love to see any quality items that may be unwearable due to stains or other issues. We love to upcycle clothing so we're always keeping an eye out for pieces to transform. For all sellable items we'd like to purchase, we offer 30% cash of the selling price. You also have an option for 50% as trade/gift card. For all items that we purchase for upcycling, we offer a dollar amount per piece based on the quality of the fabric and the condition. Anything $50 or more will be paid via check. As much as we wish every item that is purchased has a second life with us, we're still a small operation and have to be selective in our process. Please know that we value your time and personal connection you may have with your clothing so we truly appreciate you taking the step to bringing anything in. For all items that we see in person that won't be purchased and are unwanted by you, we are happy to donate it on your behalf! Step 1: Contact us to schedule an appointment for Natasha (owner of TCP) to stop by your place. Please note: We charge a $30 deposit that will be refunded upon our arrival. If you need to reschedule your visit, please do so 48 hours in advance. Your deposit becomes a non-refundable fee if cancelled or rescheduled after the 48 hour window. Step 2: Natasha will come by your place to sort through anything you'd like to sell. Please have everything somewhat organized in one area to expedite the process. Please note: We take your privacy very seriously & will never release any personal information you provide us for any reason. Natasha will always be the buyer unless told otherwise. You will be notified ahead of time if she has any assistant buyers that join her. Step 3: We buy & you get paid!! Once we have everything we'd like to purchase, we will outline an invoice digitally in which you will get a copy of. You will also sign the form digitally. Anything over $50 will be paid in check. Under $50 is cash. If you'd like trade/gift card, this will be provided digitally. We will also make sure your $30 is refunded! Step 4: And we're off! We're happy to take any unwanted clothing we did not purchase to donation. Unfortunately we won't take anything beyond what we originally sorted through to donation due to our capacity and small operation. Step 1: Contact us so we can get a sense of what you're looking to sell. Step 2: You'll fill out a form with some photos and details of the pieces. Highlighting the condition is key. Step 3: We'll notify you on what we're interested in purchasing! Shipping costs will be deducted from the payout. We do our best to find the most economical shipping options. Step 4: We'll create an invoice digitally which will have the list of items, your payout total and shipping costs. It will need to be signed by both partied agreeing to the conditions. Step 5: Once the items have been shipped and tracked as on its way, we'll send you the funds digitally (paypal or venmo) or by check. Easy peasy! !